The ultimate chocolate Valentine‘s desserts to wow your loved one! Red mirror glaze cake, made with white chocolate mousse, frozen and dried strawberries, dark tempered chocolate. 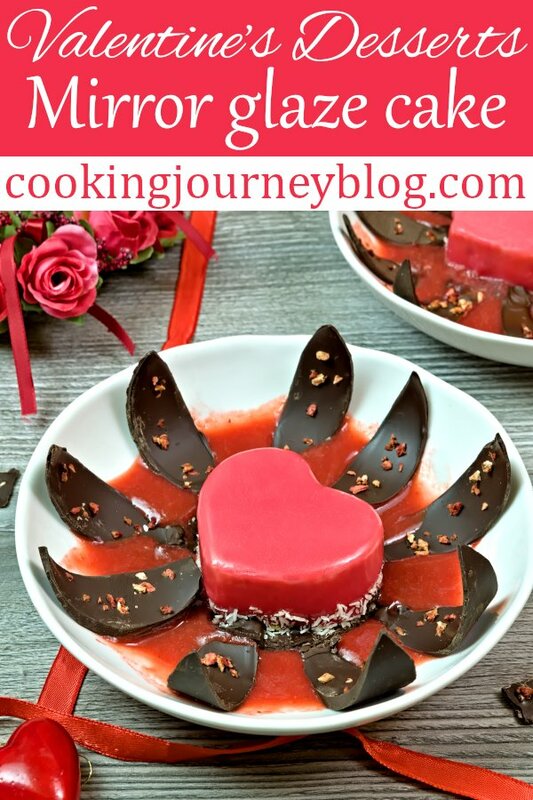 This blooming heart shaped dessert is great for gifting for Birthday or to your Valentine. Perfect treat for your sweetheart. It requires some techniques like tempering chocolate, making mirror glaze and the easy one – making white chocolate mousse cakes. But don‘t worry, I got you covered, you will learn how to make everything step by step. And in the end, if you have any questions, I will be happy to answer in the comment section below! 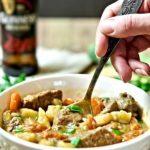 This recipe makes 4 hearts just to choose your best 2 for serving. I think it is better to have spare hearts in case something sticks to your mirror glaze or any shenanigans happens. It is also nice to have white chocolate mousse with strawberries with your morning coffee! 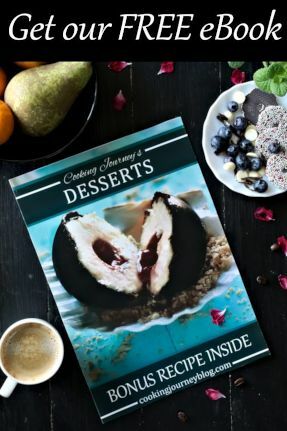 Well, if you’re confident, you can cut the recipe in half and make chocolate desserts for two. Small and lovely blooming dessert to make for a Valentine‘s day or Birthday party. This dessert is made with fruit and chocolate – all you seek in Valentine‘s desserts! 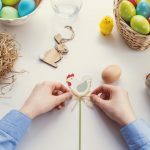 It is creative, effective and certainly will surprise your loved ones! These Valentine‘s desserts are special, but I think we can show the love and attention not once a year. Just make these to express your emotions or maybe make a proposal? This is definitely a glazed cake that excites me to create and something that will excite the person for who you will create it! 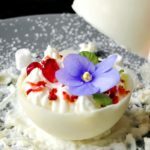 I first saw such flower dessert made by British pastry chef Darren Purchese. I was amazed and thought only chef can make it. His blooming dessert is absolutely exquisite! When I planned Valentine‘s desserts, I remembered this and decided to try make it myself. But as this is a celebration of love, there should be a heart inside! By the way, you can insert the ring in the dessert, too. What a great proposal for a foodie it would be! Share this post and tag your friend, if you agree! 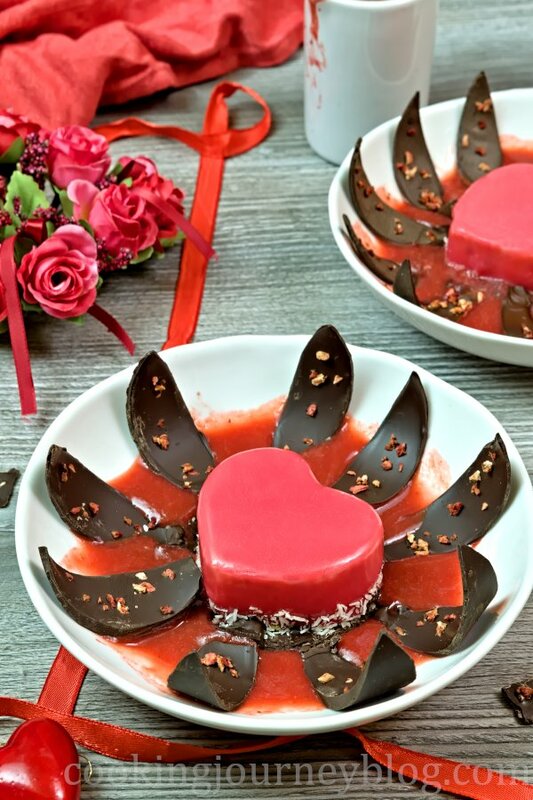 But this are fun and unforgettable Valentine‘s desserts anyone can make. I love, when the food is entertaining, do you? Give yourself some time to make it beautiful. Start 1-2 days ahead. 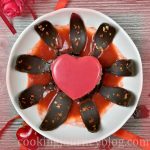 This recipe makes 4 small Valentine‘s desserts, so you can choose the best 2 hearts for presentation. Make some spare chocolate leaves in case some can break. You can make and blend strawberry sauce ahead of time, just make sure to heat it until bubbly before serving. Choose a plate, so the jam will be poured around chocolate and don’t drip to the edges of the plate. 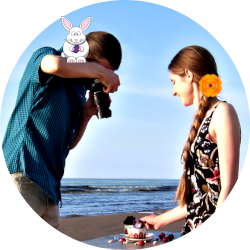 You will also need heart-shaped silicone molds, parchment paper, food rings, some patience and creativity mood! So let’s start with an easy part. Beautiful little red heart or mirror glaze cake that is white inside. 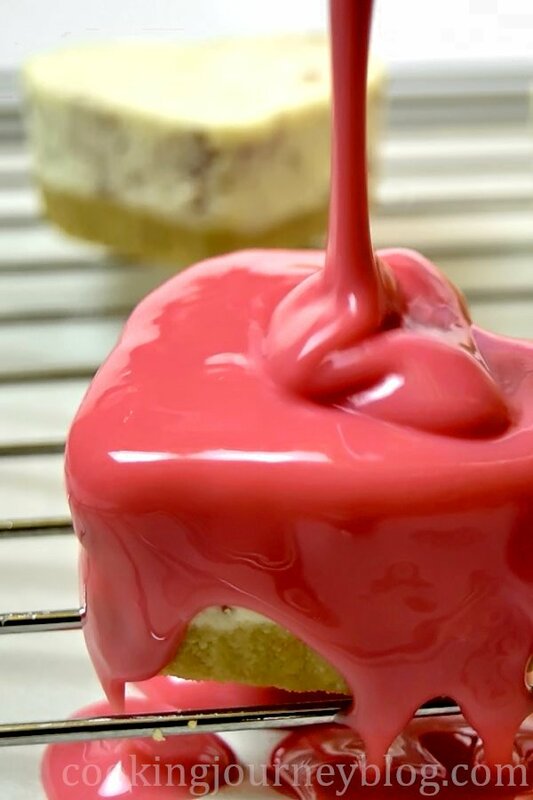 Actual heart consists of white chocolate strawberry mousse with an easy crust, made with butter and crushed cookies, all covered with beautiful red mirror glaze. It is like a mini layer cake. White chocolate mousse is the one I’ve made in Giant Black Pearl Dessert, but with the addition of dried strawberries. Do you want to make something more interesting than a regular sugar cookie chocolate covered strawberries? This mousse cake recipes are perfect for you to make for Valentine‘s day! White chocolate mousse inside this mirror glaze cake is obviously made with chocolate, with addition of heavy cream, gelatin and dried strawberries. I used silicon heart molds to make it set. The base is made with plain store-bought biscuit crumbs with melted butter, pressed into the mold. 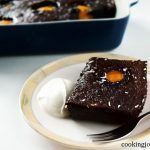 Then you will need to bloom the gelatin, melt the chocolate with the pinch of salt to cut the sweetness, whip the heavy cream and incorporate all together. It is best to set the mousse overnight, so plan it beforehand. 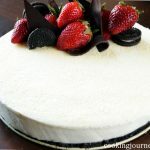 For more cake recipes you should also check our No Bake White Chocolate Mousse Cake and Raspberry Cheesecake. It is the process of making chocolate more glossy and easier to work with, while decorating these Valentine’s desserts. Melted chocolate won’t give the same effect. To temper the dark chocolate use a double boiler, which is a pan with a little bit of water and heat-proof bowl placed on top. Hot chocolate needs to reach the 114 F / 46 C temperature, when it is almost melted, remove from heat and reduce the temperature to 88 F / 31 C degrees by adding more chocolate. Moreover, it seems that it is hard to make, but it actually isn’t. To make leaves I used 2 A4 soft carton, covered with parchment paper. To hold the paper I used few binder clips. Pour the tempered chocolate on the paper and smooth with the spatula. By the way, I suggest to make a template of the leaf. On a thick paper draw the 4 inch / 10 cm long line. Then check the middle of the line and make dots to each side 1 cm. Connect the ends of the line through the dots and cut the leaf. To use the template, hold it in one hand and draw the lines, leaving the space between them. Rotate the paper and draw the other side of the leaves. Sprinkle some dried strawberries on the leaves, which is optional but makes it so much more beautiful, to my mind. Place the paper with chocolate in the 5 inch/ 12 cm ring mold or between the bottles to set. Then gently press the edges with your fingers and knife remove the leaves. You might want to make more leaves, in case some of the brake. Stick the leaves to the chocolate disc on the bottom of the plate, using some melted chocolate. Work in a cool room. You may want to use food gloves or small tongs to hold the leaves, while waiting for them to stick to the chocolate base. 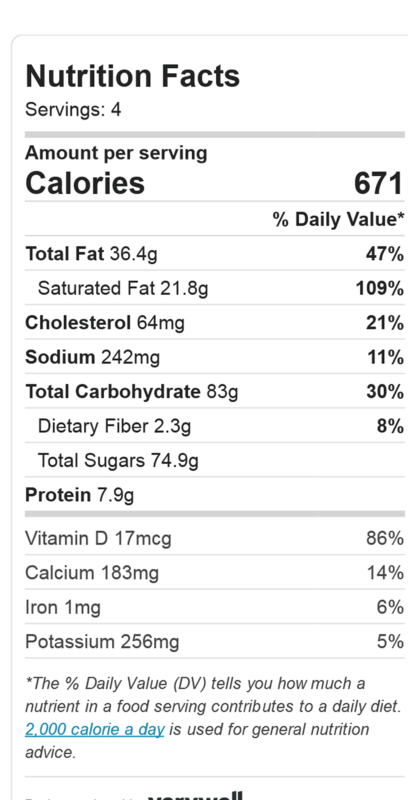 Don’t be afraid of the amount of the chocolate that is listed in the recipe. It is much easier to temper large quantities of chocolate. You can reuse and remelt the leftover chocolate for other Valentine‘s desserts next year! Mirror glaze is made with gelatin, water, sweetened condensed milk, white chocolate, sugar and red gel coloring. Depending on the color you want, use 2-4 drops of coloring. It is important to choose gel coloring, as it will give you more color and you will need less drops to use for chocolate mirror glaze. Bloomed gelatin is melted into simmering mixture of water, condensed milk and sugar. Then you pour it into a bowl with white chocolate, let it melt and add food coloring. Blend until smooth with immersion blender and sieve to remove lumps and bubbles. You can also use hand whisk instead of immersion blender. Chocolate glaze should be 91 F / 33 C before pouring on Valentine’s desserts. This amount of glaze is enough to cover 4 hearts in two coats. After first coating you can scrap the leftovers to the jar and put it in the warm water. Allow the first coat to set for 20 minutes, then pour another one on every mirror glaze cake. I used wire rack and glasses for pouring and I thing glasses work better for me, but it is easier to transfer the hearts from the rack. But just be careful and give yourself some time! You can use this colored mirror glaze cake recipe for your other dessert projects. 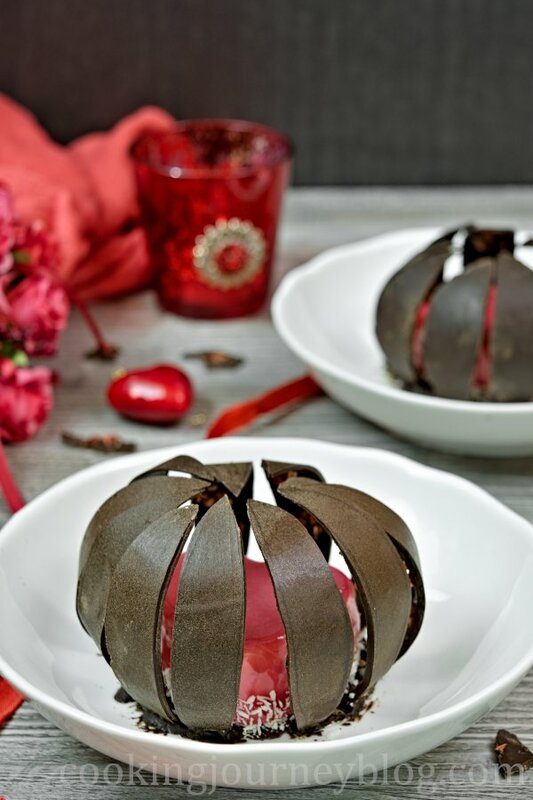 For me the most time consuming and patience requiring part of making these Valentine‘s desserts, was waiting for the leaves to glue to the base. You need to work in a cool room, maybe not in the kitchen. It takes between 40 minutes to hour to decorate one plate of the dessert, but the presentation is worth the time! Some leaves will stick faster then the others you might need to coat more in chocolate or add a little bit more chocolate on the edge of the knife on the bottom of the plate. Try to remember physics from school, the center of gravity of the leaves should be moved more to the side of the plate, so that leaves won’t fall on the heart. Keep in mind that leaves should cover the heart, but they should fall on the plate. If you’re not sure, stick the leaves bottom approximately on 45 degree angle from the the side heart or mirror glaze cake. if some leaves will fall on the heart you can help them with your fingers. If your desserts were in the fridge overnight, fallen chocolate leaves won’t stick to the mirror glaze. For blooming effect, pour around the plate hot strawberry sauce or hot chocolate. Depending on the thickness of your leaves, they will melt in the sauce if they are thin or won’t melt, if they’re thick. For the best flavor combination, use fresh or frozen strawberries, blended with some freshly squeezed lemon juice and heated in a sauce pan. To my mind, strawberry sauce will perfectly cut accompany the sweetness of Valentine‘s desserts and tart and sweet dark chocolate. 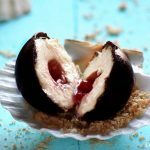 Chocolate strawberry desserts are perfect for Valentine’s day or date night! 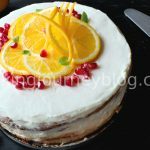 Hope you’ll try to make mirror glaze cake for your beloved one and use this as one of your gift ideas. 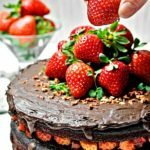 Moreover, for quick and easy Valentine’s desserts check Easy Strawberry Desserts, Healthy Strawberry Desserts with chocolate lace or Blueberry Chocolate Cake. These dessert recipes are perfect for romantic dinner. 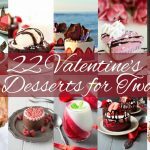 Ultimate Valentine’s desserts to wow your sweetheart! Red mirror glaze cake, made with white chocolate mousse and strawberries. Chocolate blooming heart. In a food processor put biscuits and process until crumbs. Add melted butter and process until it resembles wet sand. Distribute biscuit mixture to silicone heart molds and press with the spoon. Put in the refrigerator. In a small glass or cup combine gelatin with water. Set it aside to bloom for 5 minutes. Meanwhile, in a medium size microwave-safe bowl combine white chocolate with 33 ml heavy cream and a pinch of salt. Microwave 20 seconds, stir, microwave again 20 seconds, stir until smooth and melted (repeat, if needed). Let it cool a little, stirring occasionally. Whip leftover heavy cream for mousse until stiff peaks. Microwave gelatin for 10 seconds and add to the white chocolate mousse, stir until incorporated. Fold whipped cream into the chocolate in batches until fully incorporated and smooth. In the end incorporate dried strawberries. Distribute the white chocolate mousse in the silicone heart molds and let them set in the fridge for at least 2 hours or better overnight. Temper the chocolate. Set 30% or 180 g of chocolate aside. In the double boiler (the pan with a little water and heat-proof bowl with chocolate on top) melt bigger part of chocolate chocolate, stirring, until it almost melted and the temperature is 46 C. Remove from heat, add remaining chocolate and stir until melted and the temperature is 31 C.
Pour on the 4 pcs A4 carton, covered with parchment paper and smooth with the spatula. Holding a a template in one hand, cut the one side of the leaves with a knife. Rotate the paper and cut the other side of the leaves, leaves should be 4 inch / 10 cm long. Sprinkle dried strawberries on the leaves. Place the carton in the bigger ring mold or between the bottles, so that they are setting under the angle. 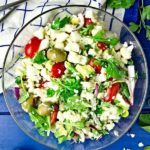 You will need approximately 10 leaves per serving, make some extra in case they broke, you can also remelt and re-temper the leftovers to make more leaves. Then pour leftover part of chocolate on tray with parchment paper. Smooth with an off-set spatula. Use a small ring to cut the discs - one per serving. Let the rings set in the fridge. Then cut again with the knife and place on the serving plates. Combine gelatin with 1/6 cup water. Set aside to bloom for 5 minutes. In a small sauce pan add condensed milk, water and sugar. Heat on low and bring it to simmer. Remove from heat, add bloomed gelatin and stir until melted. In a large heat proof bowl add chocolate chips. Add the mixture from the saucepan and top and let the chocolate sit for 5 minutes. Add desired amount of red gel coloring and use the immersion blender or whisk until smooth. You can mix more coloring, if needed. Sieve the mixture into the pouring jar to remove any lumps or bubbles. Let the mirror glaze cool to 33 C before pouring. Arrange an tray with parchment paper for easier clean up. Put the glasses upside down or a wire rack. Gently remove white chocolate mousse from the molds and with the side of the knife smooth the edges. Put the hearts with the base down on the glasses (or wire rack). Pour the glaze on the hearts and let them set for 20 minutes. Let the jar with the glaze sit in a very warm water, stirring occasionally. Check the temperature of the glaze before pouring the second layer. Let the second layer set for 20 minutes more. 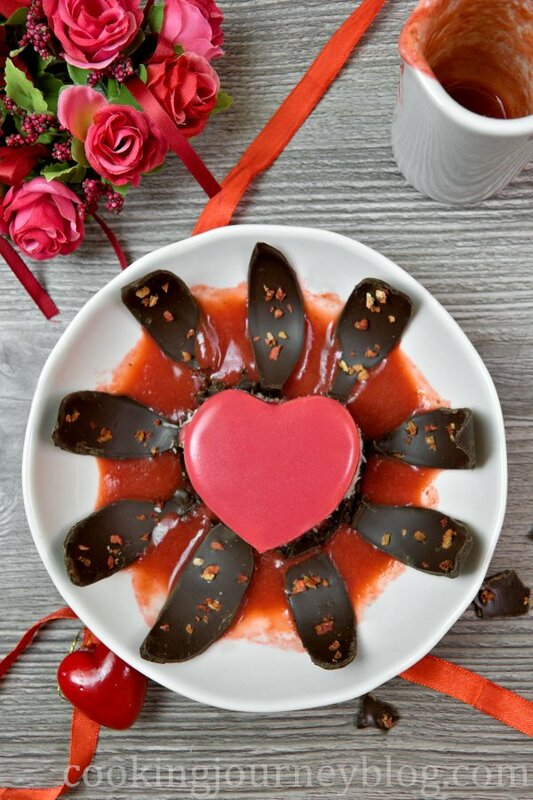 Choose the best hearts for serving and place them on the chocolate discs that you made before. Using a small teaspoon stick the desiccated coconut to the bottom of the hearts. Refrigerate 20 minutes more. Melt (use microwave or double boiler) 2-3 tbsp of leftover chocolate. Gently remove the set leaves pressing the edges with your hand or helping the to go out with the knife. Choose the best ones. Dip one end of the leaf in melted chocolate and stick it to the chocolate disc. You may consider using small tongs, if the leaves are melting in your hands. Wait until one leaf sticks, then repeat, placing the leaves around the heart, slightly covering it. *Work in a cool room and place the plate from time to time in the fridge, so it is cold. Let it set in the fridge for half an hour. Add strawberries with lemon juices in blender and blend until smooth. Heat the sauce in a pan and transfer to a heat-proof pouring jar. 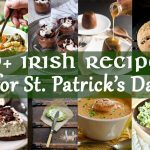 Pour the sauce around desserts and enjoy! You have outdone yourself with this stunning and delicious dessert. It is perfect for date nights in and Valentine’s Day. Thank you, Jacque! 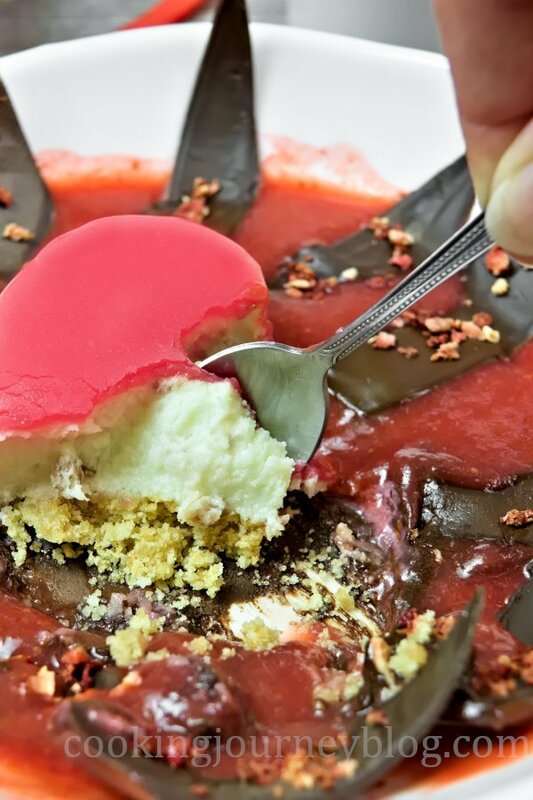 This mirror glaze cake is a perfect conclusion of romantic dinner. That is such a beautiful dessert! Perfect to make to show how much you love your valentine. Love it! Yes! We can show the love with food too. But this mirror glaze cake is truly special! I’ve always wanted to try making a mirror glaze, and Valentine’s Day seems like the perfect occasion to try! Absolutely! It mirror glaze is not that hard to make, but looks so beautiful! This dessert is just so impressive, I’d love to try it! 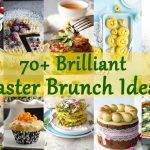 Thank you, this is a great dessert to try!